The National Shooting Sports Foundation adjusted figure for June 2017 shows a 10.9% decline from the same month in 2016. The June 2017 NSSF-adjusted National Instant Criminal Background Check System (NICS) figure of 1,016,213 is a decrease of 10.9 percent compared to the June 2016 NSSF-adjusted NICS figure of 1,140,088. For comparison, the unadjusted June 2017 FBI NICS figure 1,888,266 reflects an 11.1 percent decrease from the unadjusted FBI NICS figure of 2,123,334 in June 2016. However, if you study that graphic and read the numbers you should realize that the sky isn't falling. 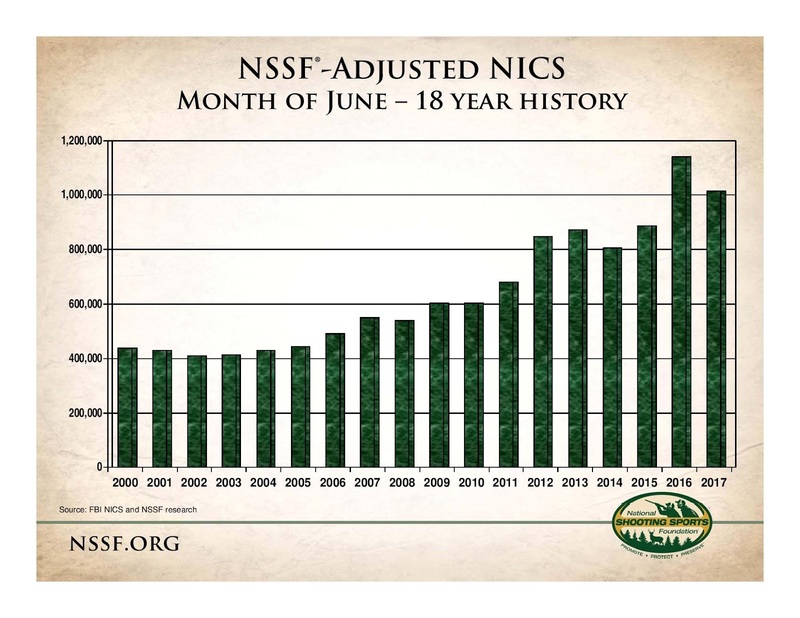 It is the second highest June on record and the NSSF-adjusted NICS number is still over 1 million checks. Gun sales are probably down from last summer when it appeared that anti-gun Hillary Clinton was going to ride into office after defeating what the media and the experts considered a weak and absurd Republican nominee. Of course we know now that she was the weak candidate and that Donald Trump wasn't that weak of a candidate. As with all reports of NICS figures it should be remembered that they do not have a perfect correlation with firearm sales. In many states a carry permit substitutes for a NICS check. Moreover, the NICS check system is also used by many states for permit background checks and rechecks. The NSSF allows for these checks and rechecks when making their adjustments to the reported monthly NICS figures. I was also going to say, that I had bought a shotgun, online and brand new, but with a CCW, I don't need a NICS check. A also bought a 1911 brand new back in Dec. of last December, and so didn't have to fill out a form or have a NICS run. So I thing that it is quite possible that the industry is still just fine, and only have signs that show up in digital methods.